Picture the lushly green vineyards and Napa Valley hillsides in full spring bloom. Now breathe in the fragrance of roses, lavender and other spring flora. Feel the warmth of May's sun on your skin. You have the backdrop for a delightful day of cycling for a great cause. Choose from four ride options—10, 25, 50 or 100 miles—depending on your level of fitness and riding skill. 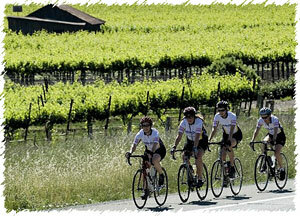 The rolling grade of the Napa Valley floor makes our 10, 25 and 50-mile routes fairly easy. Our 100-mile route encounters elevation gain as you leave the Napa Valley to ride over to the Alexander Valley and enjoy more vineyards and beautiful scenery out toward the Russian River before you head back to Calistoga. We provide full support to our riders along the way with support-and-gear and well-stocked and themed-for-fun rest stops. Back at the finish line, you will receive a hero(ine)'s welcome after which we treat you to lunch, a massage and live music. Check out our silent auction for wine bargains and enjoy the satisfaction that comes from spending a day doing good (while having fun) on behalf of others.